For the Sega Mega Drive game, see Street Fighter II': Special Champion Edition. Street Fighter II' is an 8-bit version of Capcom's revolutionary arcade fighting game Street Fighter II to the Sega Master System by TecToy in 1997. It is not a port of any specific version of Street Fighter II, but rather it is a mix between the Mega Drive versions of Street Fighter II': Special Champion Edition and Super Street Fighter II: The New Challengers, mixing elements from both. 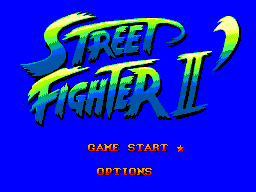 The title itself, Street Fighter II′, features the same blue fonts as the Champion Edition logo, as well as the prime symbol (′) next to the numeral, which is pronounced Dash in Japan, but is usually unspoken overseas. Tectoy planned to develop Street Fighter II' way earlier than they did, but Sega didn't approve the idea alleging it was an impossible task. After insisting for quite a while to no avail, Tectoy developers extracted some "arts" (sprites/backgrounds) from the Mega Drive version using emulators, adapted them and created a "movements' prototype" to show Sega, who still didn't approve it. At that point they decided to continue development even without approval. Development took between 5 to 7 months - 4 to 5 months of actual development, after 1 to 2 months extracting images and adapting them. Though severely watered down due to the weaker hardware of the SMS, this version of Street Fighter II is still a reasonably faithful rendition of the game. It also features the announcer's vocals which the Mega Drive's Special Champion Edition lacked. However, the game is held back by a lack of moves (the Master System only has two buttons on its controller, as opposed to the six used in the arcade game) and character voice samples, and the framerate is low. The music has also been tweaked in places. The SMS version only retains 8 fighters out of the 12 character roster from Special Champion Edition. E. Honda, Zangief, Dhalsim and Vega (Claw) are the four fighters who did not made the cut. None of the additional fighters from New Challengers (Cammy, T. Hawk, Fei-Long and Dee-Jay) are present either, despite the use of character portraits from that version. The character-specific endings are also not present in this version either: instead the ending screen consists of portraits of Balrog, Sagat and M. Bison (the same ones used in Special Champion Edition when the player clears the game using a boss character) with a generic message underneath. The staff roll is also lifted straight from Special Champion Editon, but with the addition of people who worked specifically on this version. NEC Retro has more information related to Street Fighter II'.